In a large Dutch oven or saucepan, fry the bacon until crisp. Remove and drain on paper towels. Let cool, chop, and set aside. Over medium heat, add the carrot to the pan drippings in the Dutch oven and sauté for 5 minutes. Add the celery, onion, and garlic, stirring well and cooking for 3 minutes more. Add the beans and 2 cups water. Bring to a boil, cover, and reduce heat to low. Let simmer for 10 minutes. Uncover and, with a potato masher or large slotted spoon, partially mash the bean mixture until it thickens slightly. Stir in the parsley, salt, pepper, and bacon. Serve hot. 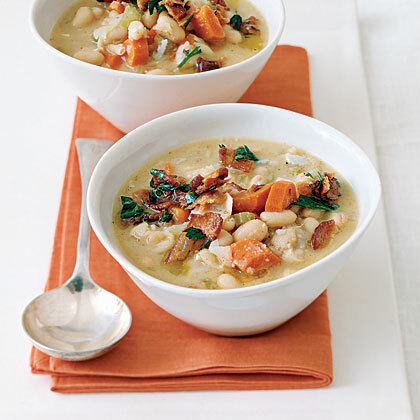 Tip: You can substitute lima, cannellini, or borlotti beans for the great Northern beans in this recipe.